The draft grades from ‘Draft Guru’ Mel Kiper Jr. are out, and one team that got a good grade is that of the 49ers, who according to Kiper got an ‘B-‘ for their collection of players over the two days. I thought the 49ers might pounce on defensive back Minkah Fitzpatrick at No. 9. When they took Mike McGlinchey, though, we knew something was up because a starting offensive tackle wasn’t a true need. That spot opened up later in the night as GM John Lynch dealt right tackle Trenton Brown (plus pick 143) to the Patriots for the 95th pick. So I see what Lynch and coach Kyle Shanahan see in McGlinchey, a big 6-8 tackle who is probably better on the right side. He needs to get stronger. His body type and feet remind me of Andrew Whitworth, who has had a great career after being taken by the Bengals in the second round of the 2006 draft. McGlinchey was the name I heard as the biggest riser over the last two weeks. San Francisco didn’t have its original second-round pick because of the Jimmy Garoppolo trade — I think they’re OK with how that turned out — but Lynch moved up in Round 2 (with the pick the Niners got from the Saints in last year’s draft) to grab a pass-catcher for his quarterback. Dante Pettis (44) had 22 receiving touchdowns over the last two seasons, and had nine career punt return TDs, including four last season. He’s an elite return man who immediately becomes a deep threat for Garoppolo. It did cost a third-round pick, but the 49ers had extras between the earlier Patriots’ trade and the Bears moving up to get Mitchell Trubisky last year. With the uncertainty around Reuben Foster’s future, I thought San Francisco might go after a linebacker early, but it waited until pick 70 to grab Fred Warner, a versatile playmaker who started 42 games at BYU. Kentavius Street (128) is a powerful defensive end. Tarvarius Moore (95) was farther down on my board, but I see the athleticism on tape that could cause the 49ers to fall in love with him. Safety Marcell Harris (184) missed the entire 2017 season with an Achilles’ injury, but he’s worth a flier in the sixth round. There were a couple of reaches here, but we have to factor in the Garoppolo deal, too. So the 49ers are in a much better spot than they were when Lynch took over. 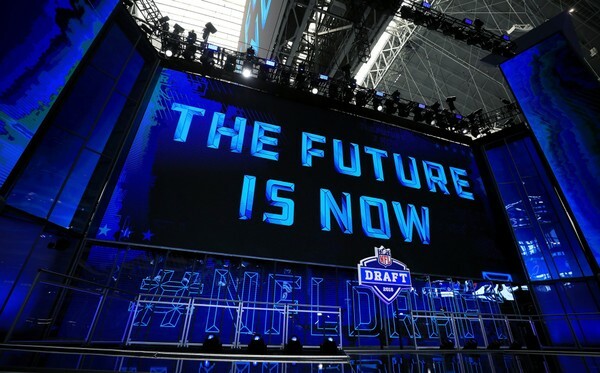 Be the first to comment on "49ers Earn an ‘B-‘ for Their Draft According to ESPN’s Mel Kiper Jr."